Pairing many tones of brown together to create one of my favourite outfits ever and during a beautiful time of year in the park. 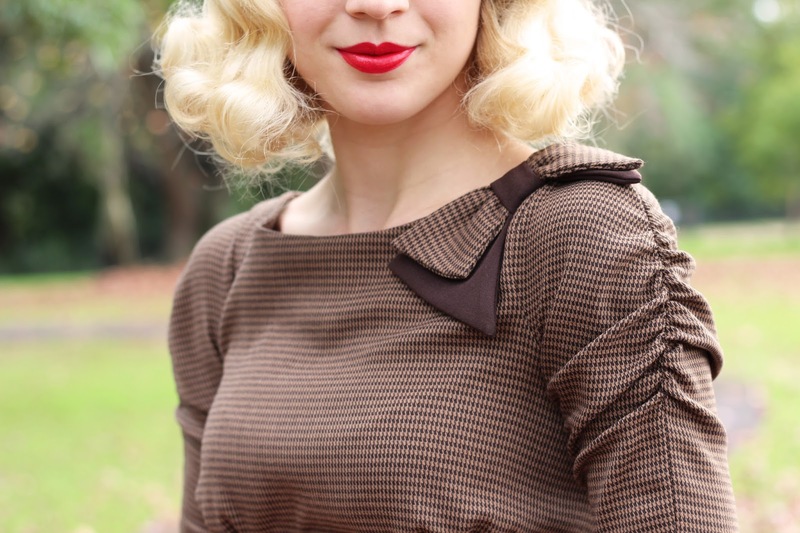 Demi Fitted Dress in Mocha Houndstooth - c/o Stop Staring! It may be winter but some of the beautiful autumn leaves still remain in one of my favourites parks where we walk the dogs. I'm going to have to say that this is one of my favourite outfits on the blog this year.... or maybe ever! I love that the different tones of brown work together so well and to me the outfit not only looks warm but it is warm. Stop Staring! is one of my favourite retro brands and I'm excited to be featuring another dress by this brand on the blog with a couple more looks coming in July. 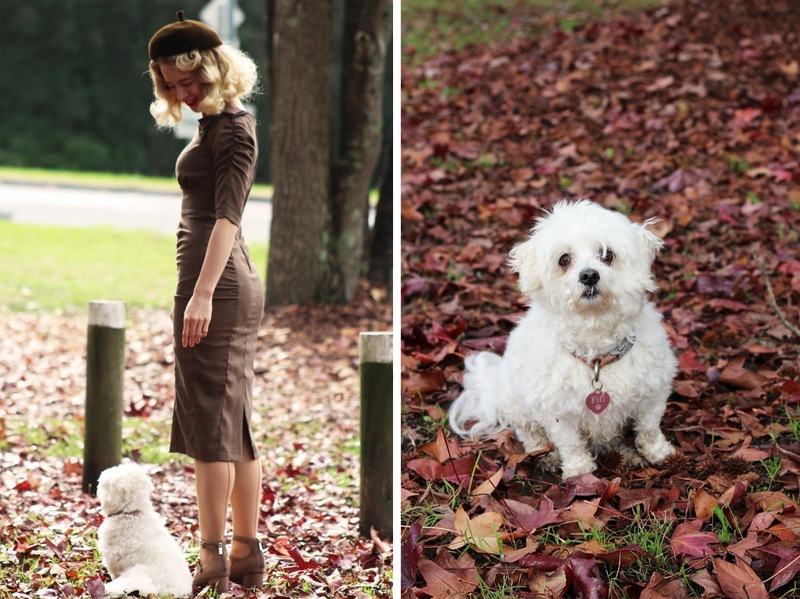 I have always liked wearing brown but lacked the perfect brown retro dress and I have certainly found it, I also really love wearing brown this type of year and so the sleeves are perfect for the cool weather we have been experiencing lately. I went with size small for this dress and I think it fits great, if I went for a size xs I would have been squished in and therefore I wouldn't be able to wear it (I usually wear size small in Stop Staring!). I'm always moving about and don't keep still too often so that is why I always talk about comfort and that little bit of extra room most blog posts. Whilst saying the the dress hugs my body so well and is so flattering. The brown houndstooth and the bow on the shoulder makes it that extra bit more detailed whilst still remaining quite a diverse that should you dress it up or down. I bought these shoes a few months unexpectedly... I walked into a store that I don't usually visit thinking that I wouldn't buy anything and then saw these shoes on super sale and I was quick to snap up the last pair in my size! They are such good winter shoes and they are gorgeous, the multiple straps and buckles are just too good. I was worried about what to pair them with when I first bought them but once this dress arrived I got a little excited as they work so well together. This hat has been in my collection for a few years now and to top it off (get it) I paired it with this outfit and it really just finished the look! I was relieved that the autumn leaves were still in my favourite park as I had to take photos of this outfit with the vibrant leaves. I was standing in front of the dog park we go to so dogs and there owners were walking in and out of the gates, Fifi and Leo were just watching them the whole time we took these photos. I made a quick little outfit video too which I have attached to the blog post above, it was a quick couple of minutes of filming before walkies continued. Love love love this outfit! The dress is amazing and suits you so well! Stop Staring is my favorite brand also. This dress is wonderful! Ahh! That shoulder detail! Be still my heart!!! Absolutely smoking hot dress! And that little beret completes the whole look. Very classy and the brown is perfect againt the autumnal leaves.